In case you just want to fly, this is the package for you. ACARS-MSFS is not the latest and greatest set of everything, but it runs almost straight out of the box. 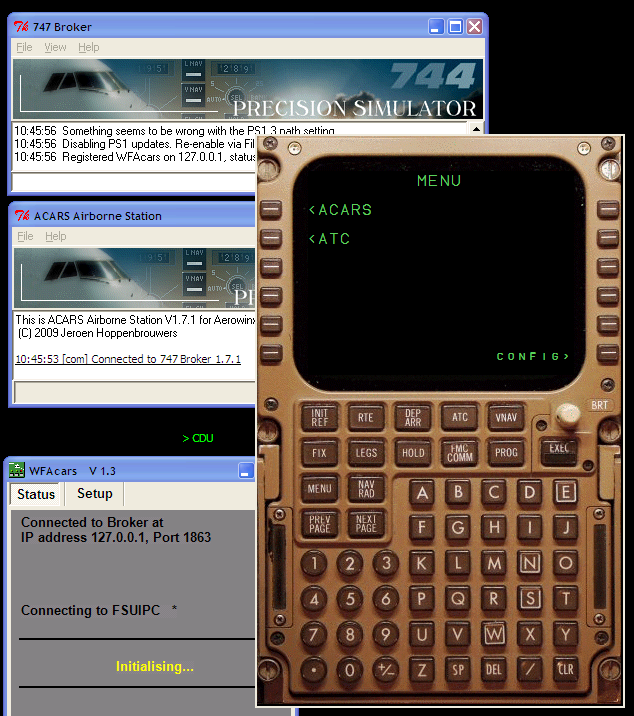 The virtual ACARS system is quite complex, and many people prefer to mix and match the various components themselves to suit their specific simulator setup. However, this flexibility comes at a price: startup effort. In order to make getting started as easy as possible, I provide a pre-cooked set of components which should cater for many needs. If you are interested and want to tune your setup, just get the individual components. When you install and run this package, you get FOUR programs running. Do not be afraid. They are harmless. Everything works perfectly on Windows 7, but as so often you have to tell the system that it is allowed to work. You need to individually set up each component to run as admin. If somebody would like to send me a screen shot or other tutorial on how to do this, I will gladly incorporate it in the documentation. I've also heard reports that especially the Broker complains at program exit time that certain folders are not installed, while they are installed. This is also due to Windows 7 using some kind of new virtual folder naming system. You can either ignore the messages (they are harmless) or install the whole combo not in Program Files but somewhere else. The program that starts first is the Broker. Windows will ask you whether this Broker may function as a server. Please allow this, as it is the reason why the Broker exists: it is the telephone exchange between the other components. You may simply minimise the Broker. It needs no interaction. You can also disregard its complaints about the PS1.3 path setting, as you do not have Aerowinx Precision Simulator. Consider the Broker to be your aircraft wiring. It is just there. The next program is the actual ACARS airborne application. 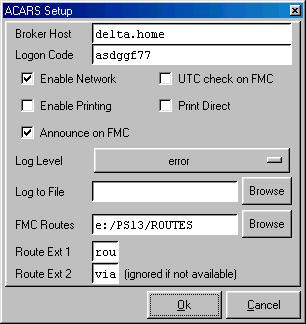 Here, you need to configure one item: your ACARS logon code. Just get yourself a logon code and put it in the box via File > Setup. 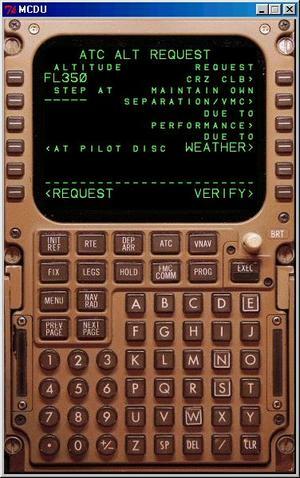 The ACARS program then may be minimised as well. It needs to run, but you will nearly never interact with it. Just as in a real plane, the ACARS module is somewhere down in the equipment center. Pilots do not look at it. The big Boeing Brown panel is your access terminal to ACARS. No, it is not the FMC. Like in the real aircraft, this control and display unit just connects to whatever boxes you have aboard, and in this case that is the ACARS unit. Actually, two modes are available: ACARS for operational communications with your home base, and CPDLC to communicate with ATC. You can access both modes also with the FMC COMM and ATC keys, respectively. Since the MCDU most likely needs to be integrated with one of your MSFS computers, it comes out of the box with a small floating icon, the green icon left of the MCDU in the screen shot above. This floating icon always stays on top of everything else. You can drag it out of the way. When you need the MCDU, double-click the icon. When you don't need the MCDU, double-click the icon again and the MCDU will disappear. To stop the MCDU program, right-click the icon and select Exit. If any of the MCDU's annunciator lights comes on, the icon will change colour. You can reposition the big MCDU by dragging it around with the right mouse button. The last component is called WFAcars. You should think of this module as the connection between the ACARS box and your avionics. With WFAcars, you can feed your position and other data directly to ACARS. For this magic to work, you need to give WFAcars access to MSFS, and this is done by the regular FSUIPC mechanism. If you run all your programs on the same computer, this should just work. If you have MSFS on another machine than WFAcars, you need to run WideClient or another network bridge. You can also move WFAcars to another computer and change its configuration (by the Setup tab) so that it can find the Broker again. There are a few things that you cannot avoid reading. The general ACARS introduction is a must-read. 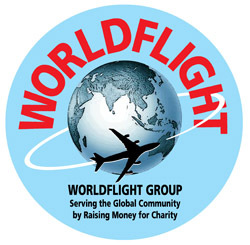 Also the World Flight procedures below will be enlightening, as they give a complete overview of what is possible. All the components have plenty of configuration options, which you may want to explore. Each component also has its own documentation on this web site. Please refer to it when needed. Although ACARS and CPDLC are definitely useful outside the annual World Flight event, WF still is a main reason why I develop such systems. In order to get all 100+ planes on the same leg properly handled, some guidelines are in place. Go here to read them and check back once in a while for updates. A transcript of a typical World Flight leg with voice, ACARS, and CPDLC is provided as an educational example.